We’d love your help. Let us know what’s wrong with this preview of Book in a Month by Victoria Lynn Schmidt. If you make time to write and put away all of your excuses, could you stay on track and finish your novel in only a month? With a structured plan and a focused goal, yes, you can! To ask other readers questions about Book in a Month, please sign up. 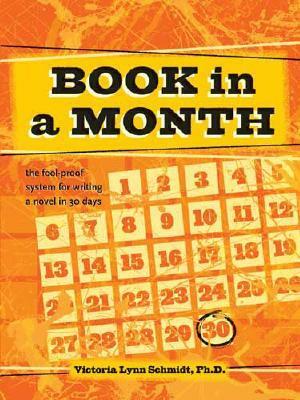 To be honest, I'm not sure how helpful "Book in a Month" would be if a writer follows it down to the teeth. Speaking from experience, I didn't follow it strictly on the day to day activities it prompted me to do. 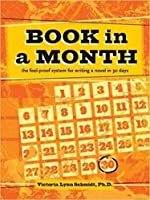 I would often do two to three days worth of plotting/planning from the book in one single day, just in 20 minute bites of time. And noting that Schmidt relies on three act structure (which some of my stories do not follow) that might be something worth noting for people who may or may n To be honest, I'm not sure how helpful "Book in a Month" would be if a writer follows it down to the teeth. Speaking from experience, I didn't follow it strictly on the day to day activities it prompted me to do. I would often do two to three days worth of plotting/planning from the book in one single day, just in 20 minute bites of time. And noting that Schmidt relies on three act structure (which some of my stories do not follow) that might be something worth noting for people who may or may not use that particular form. I think I might have found this book very appealing during my early days of NaNoWriMo, but since then, I've discovered that 1) I'm not an outliner, and 2) I really don't like my output when I write that fast. She also sells this as a system in which you can skip nothing and that's not very appealing either, especially on the heels of Bell's more modular Plot & Structure (which is overkill for someone doing their first NaNo, I suspect, but it depends on what you're looking for). I think she oversells the final product from her program, too. One piece of advice, for example, is "Watch the length of your sentences, paragraphs, and chapters. Use the white space on the page to your advantage." Maybe during revisions, but this sounds like a waste of time during the first draft. Even if you're working from an outline, you're going to end up making text adjustments in the final version once all your plot points are where you need them to be. Plus, I wouldn't just start adjusting the lengths of the sentences, etc. It's better to scrutinize why blocks of text look the way they do if they appear daunting or are ruining pacing. Was there an excessively long descriptive passage? A backstory info dump? Simply adding more paragraph breaks to things like that are not going to fix the real problem. This advice felt very superficial to me. She also suggests a check during the third week to make sure you've hit on all the critical elements of whatever genre you're writing. "After all, you do not want to be in the romance section if your book doesn't have much romance in it. You will lose all your readers." Talk about jumping the gun. There are a LOT of revisions to be done before the book will see the shelf (unless you self-publish without revising, god forbid). And who's to say that the romance you set out to write might not turn into a great mystery instead? Would you be packing in the love scenes just to get your book shelved in a different place? I doubt it. Cross-genre books are very popular, plus shelving is not something you can personally control anyway. So, although I think this book isn't bad for a beginning outliner, I'd think critically about what she's asking you to do. Some of it doesn't make sense and isn't necessarily going to help you move forward. Some of it feels like busy work. Maybe the biggest reason to buy this book is if the workbook/daily homework aspect appeals to you, because you can get outlining methods and info on the three-act structure in lots of other books. I personally believe that to write a book in 30 days borders on insanity, I enjoy reading the different methodologies for accomplishing this Herculean feat. Of all the books I've perused, this one remains my favorite. Schmidt's approach requires a systematic way of approaching one's writing. As you move through her book, you fill out various forms (which you can download off of the Writer's Digest website) to create a template for your novel. She explains there reason behind each template and ho I personally believe that to write a book in 30 days borders on insanity, I enjoy reading the different methodologies for accomplishing this Herculean feat. Of all the books I've perused, this one remains my favorite. Schmidt's approach requires a systematic way of approaching one's writing. As you move through her book, you fill out various forms (which you can download off of the Writer's Digest website) to create a template for your novel. She explains there reason behind each template and how the results will apply to your writing. Being a bit of a form junky, I found myself thoroughly enjoying filling out the template when I worked on my first project. I also found that the templates made me view my story from a deeper perspective and revealed the flaws behind some of my writing ideas. This is a workbook. It has explanation of a system of structuring and then writing a novel in 30 days that really works. Of the five publications (books) I've had published, I wrote all five on this system of novel building, writing, and revising. In every case, with no exception, the novels I've written using this book (workbook) ALL WERE PUBLISHED FROM THIS FIRST DRAFT I GENERATED USING BIAM. BIAM, Book In A Month: Day 1, 2, 3, ...30, are begun with a brief two or three pages of instruction, us This is a workbook. It has explanation of a system of structuring and then writing a novel in 30 days that really works. BIAM, Book In A Month: Day 1, 2, 3, ...30, are begun with a brief two or three pages of instruction, usually a form or two to fill out with such things as characters, settings, scenes, outline of scenes, and plotting. It features a novel development that is divided into three parts, similar to a three act play. The rise and fall of action and the climax are all eased out of your mind onto the paper in a studied and practical manner. The books I wrote in 30 days (also used Ywriter5 as my computer word processing structurally helpful program). I submitted the exact draft that came out in the 30 days and in each of the five novels my FIRST DRAFT was what the editor/publisher accepts as a completed novel. I am serious, I had a few typos, and some minor adjustments in language and voice, but basically this method produced a publication ready novel every time for me in a month. I am enthusiastic about this workbook. I. Have used about twenty of them. I buy them for about 2 or 3 bucks on abebooks.com unused, rather than on Amazon or similar sites for 14 bucks or so. These used copies come in mint or near mint condition, all the forms empty and no markings in these books. I am available to give hints on how to use this book. I would enjoy the dialogue. Just let me know if you need help writing a novel. This is my hoppy -- helping writers -- so ask and it is yours. If you want to publish a novel, this is an essential beginning resource, and it works. I published as Jacob Campbell, and although some are no longer in print, you can get my books on abebook.com too. Five stars for sure, actually ten stars! all while screaming "Don't tell me what to do!" I'm definitely one of the ones who feels like very "structured" classes on writing take away from the creative process. I don't like being told HOW to do things. This is probably a character flaw of mine. I'm working on Totally loved this book. I'm definitely one of the ones who feels like very "structured" classes on writing take away from the creative process. I don't like being told HOW to do things. This is probably a character flaw of mine. I'm working on it (No I'm not). Anyway, this book takes the "suggestion" angle. The author is not telling you HOW to do anything. Instead she's offering you options and wisdom about what's worked for her and other writers. It's very much a book that is saying "Just do this and see what happens!". So, I guess what I'm saying is that the tone of this particular book is very chill and friendly. It's encouraging and leaves room for you to do exactly what you need to do to write your first draft, even if it doesn't fit entirely in with her worksheets and suggestions. Here is a teacher who is giving you the freedom to have a personal and enjoyable experience that isn't full of stringent rules and very black and white boundaries. It's like the Montessori of writing reference books. It wasn't a bad book - it gave a few good pointers on finishing a novel within 30 days. The worksheets are interesting, but it drives the potential author into a formulaic approach to writing. Also, it may be a good resource for new authors, but I didn't gain much value from the daily exercises. Wow. This book has actually been a quite useful time management tool for writing fiction, and I'm only 2/3 of the way through it. Great for those prone to procrastination and in need of encouragement. I managed to complete a 54 page rough draft in a month and a half. I love this book. I've written about three novels. Though some people might find it formulaic, I've got a good deal out of the structure. You can also pick and choose which exercises you'd like to do, but the great part about the book is that you WILL write that novel you've been putting off! This is one of the first books on craft I read and it still helps form the spine of my structural style. I know, it's not a book about structure. Except it is, in many ways. It also gives great advice for fast writing--but I caution anyone to take what works and discard the rest--don't try to shoehorn yourself into something that just doesn't work for you or makes you miserable (I recommend "Dear Writer, You Need to Quit" by Becca Syme for finding your own rhythm). This is a great book. I own a copy and use it as a reference. It's great at helping you set goals and find plot holes. I learned some great writing techniques to help me get the story flowing. Still, I feel compelled to mention, not all books can be written in a month. The BIAM process was written and is used by a career fiction writer who writes formulaic books. With that being said, if you are writing a romance novel there are certain rules you must follow. When you follow all those rules, you This is a great book. I own a copy and use it as a reference. It's great at helping you set goals and find plot holes. I learned some great writing techniques to help me get the story flowing. When you follow all those rules, you can write a first draft in a week really. It's boy meets girl. Boy and girl hate each other. Something happens to make them realize they need each other. Then something happens to make them start to be romantically attracted to each other. Something drives a wedge between them, that they finally work through and then they live happily ever after. Oh, and don't forget the guy has to save the girl in some way. Any book outside of a set formula, and there are tons of formulas, you need to give yourself some realistic goals, but set some. Even if you fail to meet them, keep showing up to the blank page because eventually you will finish. I found this book to be extremely helpful, but I didn't finish my book in a month because I wasn't writing a formulaic book. It doesn't make me a failure, in fact, not finishing a book in a month is more normal than finishing one in a month. Before I start my review, I'll be straight up: I did not end up writing a book successfully in 30 days, BUT! That's no fault of the BIAM system. Knowing how big demands at my work were, I wasn't expecting to finish a full out novel. I have done it in the past with Nanowrimo and it takes a lot of time, which I sadly don't have. Why use this book then? Well, I was hoping it would help me draft a novel idea I had and help me get some words on the paper. With that I'd say I was successful. My bigges Before I start my review, I'll be straight up: I did not end up writing a book successfully in 30 days, BUT! That's no fault of the BIAM system. Knowing how big demands at my work were, I wasn't expecting to finish a full out novel. I have done it in the past with Nanowrimo and it takes a lot of time, which I sadly don't have. Why use this book then? Well, I was hoping it would help me draft a novel idea I had and help me get some words on the paper. With that I'd say I was successful. My biggest fault as a writer is that I start strong and fizzle fast. I can't tell you how many half finished stories I have laying around on my computer, something needed to change! Not sure if I like this book. I definitely learned some things, so it wasn't a complete waste of time but it didn't help me write a book in 30 days. The worksheets are more of a distraction from writing than a tool for getting a draft done. This gave me everything I needed to tackle (and WIN!) my first Nanowrimo, with a story that has since been developed into a full novel. Worked for me! Has a very good set up to help you develop your novel in just one month. It has lots of exercises for you to do while you are writing your draft to help you get through the process. It will involve a lot of writing that will never end up in the actual book though, so this method may not be for everyone. It would actually probably work very well if you already had a rough draft of your novel and then used the exercises to make sure you're on the right track. I feel that this book will help me with editing or making the outline of a book that I've written to help fix it then it would to actually write it in 30 days. I'm a seat of the pants writer. Interesting and perhaps helpful to some, but it didn't do anything for me. There are some really helpful nuggets of information in this book. I enjoyed reading it and made lots of notes, which to me is always a good sign that its content is useful. I then tried to put its advice into practice during NaNoWriMo, and realised that there were a few sections where the author listed actions that you should do on a particular day (or gave headings to fill in on a worksheet) but then didn't actually explain what those activities meant, or suggest any examples. So sometimes it There are some really helpful nuggets of information in this book. I enjoyed reading it and made lots of notes, which to me is always a good sign that its content is useful. I then tried to put its advice into practice during NaNoWriMo, and realised that there were a few sections where the author listed actions that you should do on a particular day (or gave headings to fill in on a worksheet) but then didn't actually explain what those activities meant, or suggest any examples. So sometimes it felt like I'd been led down a bit of a dead end. Having said that though, there were plenty of other sections where the advice was detailed, practical and relevant. As well as advice on how to structure a story, there was also discussion of how to write a good story, and suggestions of basic elements to include in several popular genres. Unfortunately for me, none of these suggestions included sci-fi or fantasy, so if you're writing in those genres then you're on your own. On the whole though, I got a lot out of the book and enjoyed the ordered, logical 'step by step' feeling it gave me (even though of course that all went out of the window when I was actualy writing). It will definitely be a reference resource that I use again in future. A friend of mine picked this book up and handed it to me to look at after I told her I had read a similar 30 day novel writing book so that I could compare them. There is no direct comparison, though. While they both deal with outlining in some fashion, I think the approach in this book is much more usable, especially to a writer who is new to outlining or who prefers to be a "pantser". And, of course, you really only need to use whichever items make sense for you, even though the daily exercise A friend of mine picked this book up and handed it to me to look at after I told her I had read a similar 30 day novel writing book so that I could compare them. There is no direct comparison, though. While they both deal with outlining in some fashion, I think the approach in this book is much more usable, especially to a writer who is new to outlining or who prefers to be a "pantser". And, of course, you really only need to use whichever items make sense for you, even though the daily exercises given do encourage the use of the worksheets provided, so if you are a more advanced outline writer, I think you could still glean some good advice from this book. As an aspiring writer, I have been looking for resources that will help me organize my time and my ideas in order to produce a finished manuscript. I think I have finally found it in this book. While not every single exercise fits my book idea, the overall structure of how to get from the first page to the last page will be very useful. I was most impressed by the first third of the book that aims to eliminate the resistance that I know I, as a first time novel writer, deal with every day. After As an aspiring writer, I have been looking for resources that will help me organize my time and my ideas in order to produce a finished manuscript. I think I have finally found it in this book. While not every single exercise fits my book idea, the overall structure of how to get from the first page to the last page will be very useful. Schmidt lays out how to write a book in just one month. The bad news is that you likely can't start the book on day one of your bookwriting month. Instead, you'll want to spend the month outlining and fleshing out the story before you begin your book-writing month. That said, Schmidt does have a day-by-day worksheet layout (you can find the worksheets online for free) so that you just might be able to write the book--or at least parts of it--within a month. Lots of help, and Schmidt has an online Schmidt lays out how to write a book in just one month. The bad news is that you likely can't start the book on day one of your bookwriting month. Instead, you'll want to spend the month outlining and fleshing out the story before you begin your book-writing month. Lots of help, and Schmidt has an online group based around this book, too. Currently, I am using this book to write my first draft. I'm sure my first draft will be awful but I will spend months, maybe years, editing in hiding. I love the format of this book since I thrive on list and structure to get anything done. If you like to have a project organized to completion try this book. However, if you just want to write like a mad person, and that may work too, then stay way from this book. If you are a Polly Planner, BIAM has a plethora of worksheets to satisfy your obsession. The first portion of the book was full of "you can do it!" platitudes (I bought the book, already. I obviously think I can do it.) The remainder is an exercise extravaganza to brainstorm outlines. Great reminders/advice of what makes a story great from an experienced writer. PDF's of the worksheets are available online, but thorough explanations are in the book. This is an excellent book to help you get your notes and thoughts organized to write a book. Even if you don't get through writing the book on 30 days, you will be so much better organized and ready to produce your masterpiece. I am going through my first attempt write a rough draft of a novel in one month. I am in week one, but things are going well, and I'm almost one-fourth done. I think this is a fabulous book with valuable information and worksheets. However, I wouldn't use it to complete a book in a month. So much time is spent reading and completing the worksheets that it really isn't feasible to write unless you have completely ditched all of your other responsibilities for the month. But the information alone was exceptionally useful. Perhaps a better title would be "Book Outline In a Month". I think this is a useful tool for those who prefer a methodical approach to planning their novels but otherwise a less-than-useful resource for those who have already planned out their book and simply struggle to actually sit down and write the thing.